If you follow the news and have seen all the attention bed bugs have received in the past few years, you might think you know all there is to know about this pest: They feed on humans while they sleep, they cause itchy, red bumps and they are hard to get rid of! But these pesky insects have a lot of secrets that you might be surprised to learn. Check out these weird and wacky bed bug facts! Fact #1: Bed bugs can live anywhere. When most people think of bed bugs, they think of hotels. But the truth is, bed bugs can thrive in single-family homes, apartments, hospitals, college dorm rooms, office buildings, schools, buses, trains, movie theaters, retail stores and just about anywhere that humans are. In fact, according to the “Bugs without Borders” study, 89 percent of pest professionals report treating bed bug infestations in single-family homes, and 88 percent report treating bed bug infestations in apartments/condos. Respondents also report other common areas, with 67 percent treating bed bug infestations in hotels/motels, 35 percent in college dormitories, 9 percent on various modes of transportation, 5 percent in laundry facilities, and 4 percent in movie theatres. Fact #2: Bed bugs aren’t just city dwellers. Contrary to popular belief, bed bugs are not just in big cities or third-world countries. They are found in all 50 states. The NPMA’s ” Bed Bugs in America” survey found that 17 percent of those surveyed reported having bed bugs in the Northeast; 20 percent in the Midwest; 20 percent in the South; and 19 percent in the West. However, the incidence of bed bugs is three times higher in urban areas than in rural areas due to factors such as larger population size, apartment living and increased mobility, which are conducive to the rapid spread and breeding of bed bugs. Fact #3: Bed bugs are hardy. These pests can live for several months without a blood meal. This means they can linger in furniture, bags and suitcases for a long time until they are near a human host again. In addition, bed bugs can survive temperatures of nearly freezing to 122 degrees. Because of this, bed bugs are not a pest that can be treated with DIY measures. Professional pest control is the most effective way to treat an infestation. Bed bugs have a predictable feeding pattern. Once a bed bug finds a host, it will usually feed for 5 to 10 minutes until repletion. Sometimes the pattern of bed bugs feeding is jokingly referred to as breakfast, lunch and dinner as bites will often be found in a pattern. 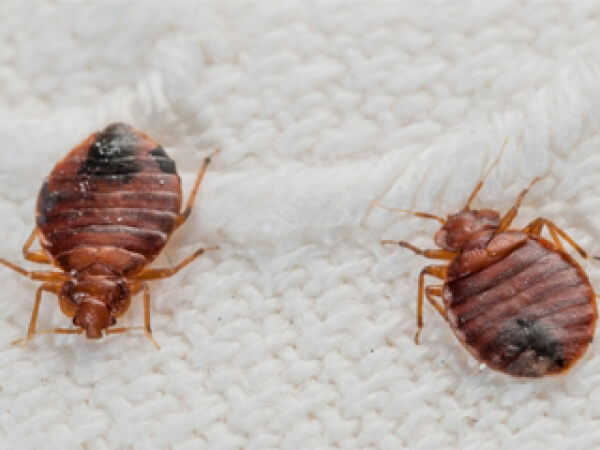 But the bite marks they leave behind – often in clusters or in a row on exposed skin on the chest, arms or legs – are telltale signs of a bed bug infestation. If you have a bed bug infestation, don’t try to treat it alone. Instead, contact a licensed pest professional who is trained on the (unique, often sneaky) habits of bed bugs. They will be able to inspect your home and recommend an effective course of treatment.